Exercise is central to the wellbeing of many people. As well as maintaining your physical health, it promotes better mental health through the release of neurotransmitters like serotonin. The majority of the exercise industry focuses on those who do not have a disability, which often makes engaging in routines at home challenging. While the scope of out-of-the-home facilities continues to grow, home-based commitments and other challenges may mean you want to spend time exercising at home. If the aim of your exercise is to lose weight and get your heart rate going, weights need to become a vital aspect of your routine. Start small when you are using weights for the first time. The chances are you will adapt to them rapidly, but starting out too large can cause injuries and set you back with your routine. Try taking a novel approach to weights by using a kettle bell or weights with straps. You don’t need to hold a degree in anatomy and physiology to use them, but doing a little research and discussing them with a medical professional is recommended. For every pound of muscle you gain, you burn 30 more calories a day. That certainly makes weight lifting attractive. A growing number of consoles are beginning to offer console-based exercise programs. This includes the Wii, X-Box Kinect, and PS3/4. Not all of them have disability-friendly components, but some of the Wii programs are worth trying out. When you exercise, stretching before and after helps your muscles to warm up and cool down. While most people are unlikely to cause themselves serious injury without a cool down, they will experience aches. Not warming up can lead to strain injuries, which can put you off exercising in the future. Again, learning a little about your anatomy and asking a medical professional about basic stretches is useful before you begin. Try to use areas around your home as well. Bars in your bathroom can provide support as you stretch, or you can use your bench top to reach across. The aim is to give all of the muscles you intend to use during your workout a stretch before and after. Boxing: Punching across the body with increased movement and intensity is a great way to engage in cardio. When using the right arm, punch to the left and vice-versa. When doing this, do not lock your elbows. To tone and build muscle, add on small hand weights and lock your core if possible. Chest press: Holding your upper body against a wall or on the floor, press your trunk away from it. This is a great way to build strength in the upper body. Shoulder press: Using one weight held in two hands, a kettle bell, or a medicine ball, press upwards away from your body and gently lower the weight down again. Alternatively, you can try the ‘halo’. This involves circling the weight around your head using two hands, and then switching sides to achieve an equal number of reps. 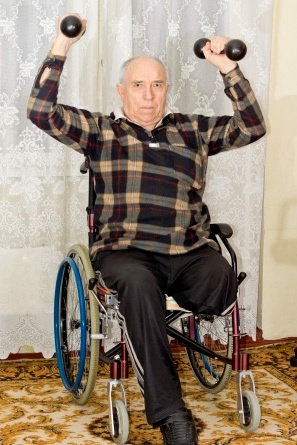 It is possible to adapt many exercises people engage in within the home to make them disability friendly. When exercising, always make sure you focus on your breathing. Many people hold their breath without realising it as they exercise, and this can cause you to become out of breath easily. Keep a record of the amount of reps you can do when you start and focus on your progress. The more you motivate yourself, the easier exercising becomes.